In the seventh movie, General Maji (マジ将軍, Maji Shōgun) was one of Ratchet's subordinates, acting as one of Mecha Island's generals. He has blue fin-like hair and tends to speak in a vulgar and impolite way, to Ratchet's annoyance. He usually fights using his master's inventions, and he's the one that attacks Straw Hats when they arrive on Karakuri Island. 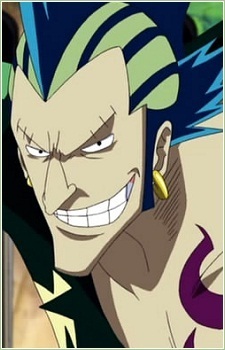 He fights Zoro in a car with buzzsaws and is beaten easily. His name means "really".